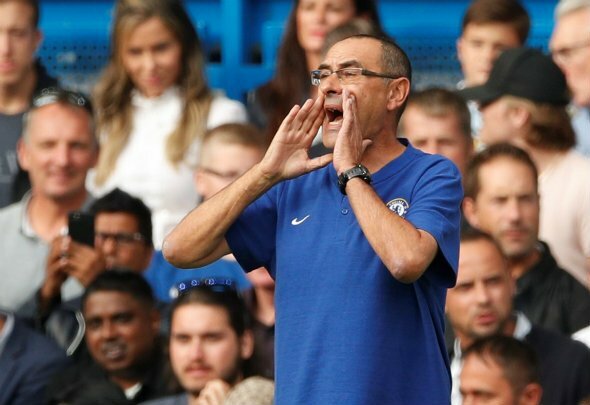 Maurizio Sarri is predicted to make three changes to Chelsea’s starting line-up ahead of their Premier League match against Brighton at Stamford Bridge on Wednesday night. Eden Hazard and N’Golo Kante both started on the bench when Chelsea beat Cardiff 2-1 on Sunday, but they could be recalled into the first 11 this week. Mateo Kovacic and Willian are likely to pave way to the two stars. BBC Sport has reported that Marcos Alonso is “unlikely” to play due to a hamstring issue, and that means Emerson Palmieri could be handed his fourth Premier League start of the season at left-back. 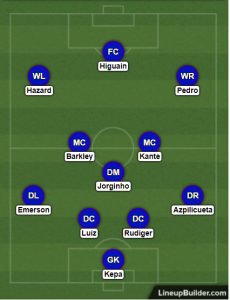 Kepa Arrizabalaga is predicted to start in goals behind a back-four of Cesar Azpilicueta, Antonio Rudiger, David Luiz and fringe player Emerson. Kante, who was an unused substitute at the weekend, is likely to join up with Jorginho and Ross Barkley in Sarri’s midfield. Pedro and Hazard could be named as the two wingers against Brighton while it is expected that Gonzalo Higuain could spearhead the attack. Chelsea have won their last nine meetings with Brighton dating back to 1967, and three points against the south coast club on Wednesday night would see them move up to at least fifth place. Manchester United are currently fifth but lost to Wolves on Tuesday and fourth-placed Tottenham take on Crystal Palace at the same time as Chelsea play Brighton. If Spurs drop points in that game then Sarri could take the Blues up to fourth and revive the club’s bid to qualify for next season’s Champions League.